If you’re searching for room heating elements in Bangalore, then Chhaperia is the best industry which focuses on quality and delivers unit on-time. In the era where technology is a necessity at every home, Chhaperia offers a wide range of heater elements to beat the cold. As per the request raised by the individual, we install the particular unit at their place. With lifespan and power-saving modes, multiple heaters are available. The heat settings involved in fan heater are of two types. With 80-degree oscillation, the fan heater covers most of the area in the room you’re placing it. A ceramic element installed in the fan heater consumes less energy thus becoming energy-efficient. Adjustable thermostat for increasing or decreasing the temperature. Protects from over-heat and tip-over cut out switches. 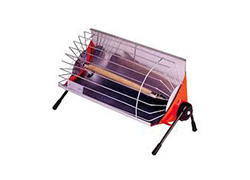 Chhaperia is a top-notch producer and became the best supplier of room heating elements in Bangalore. Our team of experts has shown the enthusiasm to produce the best heating elements and systems to meet the needs of industry as well as the individuals.